This recipe was delicious however I could not get the glaze to harden. Does anybody have any suggestions? So sorry you didn’t have total success with the recipe. Did you coat the berries with flour? As noted in the recipe, the berries should be moist enough so the flour sticks to the berries. I imagine the bread was still delicious, just not as evenly speckled with the berries as one would like. This is in my oven as we speek.I added 14 cup more flour to the batter so i could use one cup more bluberries i also wasn’t able to get the full amount of zest from my lemons so I use orange to make up the difference and will add half lemon and orange to the glaze. My house smells delish. Oh my! Hubby would love this! Pinning now! Thanks for sharing! Made this for the holiday’s and it was wonderful. Made yesterday, loved it. Blueberries did not sink to the bottom. Could i make this in a budnt pan instead of a loaf pan? My six year old granddaughter and I made this today, everyone loved it. 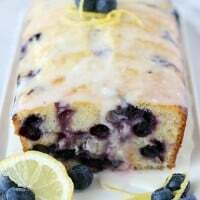 The lemon blueberry bread looks very yummy. My husband is a diabetic. Can the sugar be replaced with Splenda? I have made this bread 3 times already…so yummy..my kids love it. Made this for brunch today, ph my so yummy! I did use frozen blueberries which I took out of the freezer and ran cool water over them and let them sit to defrost while making everything else, I did coat them in the tablespoon of flour just before folding them in. I did not have any issues with them sinking to the bottom. I highly recommend this deliciously easy recipe! Can you make theis as muffin instead of loaves? I made this today and it was a huge hit with us! I had purchased a big carton of blueberries at a great price, and had lemons on my tree, so it seemed like a good recipe to make. It turned out beautifully, and I will definitely make it again. Moist with just the right amount of lemony goodness. I made two of these. They were awesome! Texture is almost like pound cake, but very moist. Gave one to my sister. She loved it! I coated my blueberries with flour as you noted. Great idea! I doubled the glaze recipe since I made two. It really doesn’t need all that liquid or to be doubled. Thanks so much. 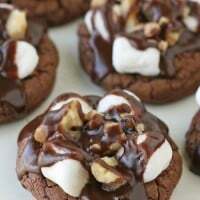 I will be making them again! I made this today and the middle didn’t cook at all. I even cooked it for five minutes longer. I’m very disappointed. 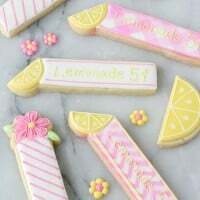 Would like to make this. Need the recipe. 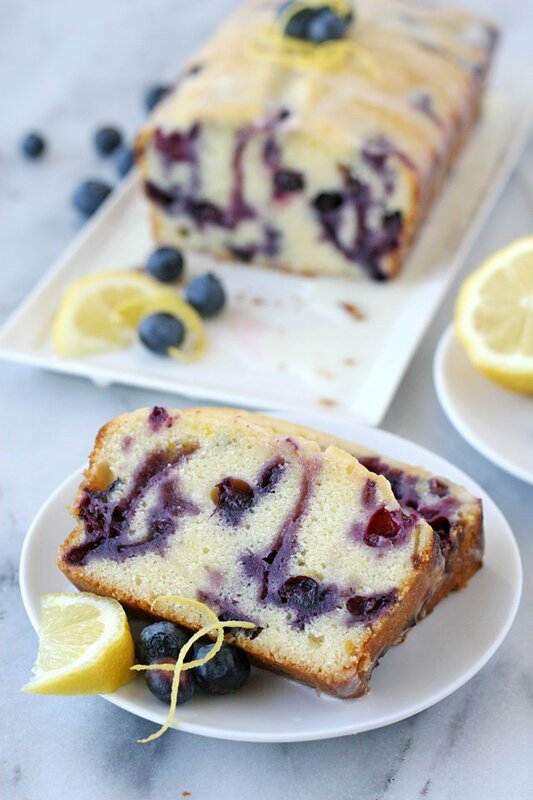 HI Glory!i made this amazing lemon blueberry loaf this afternoon, it is amazing! I used half and half since I didn’t have any milk. It is so moist and perfect. My hubby found your video on facebook and asked me to make it. I posted a pic on Instagram and tagged you! This is a huge hit with my my family and co-workers! Have made it a few times for bake sales at work, and as a just because. The flour on the blueberries is KEY! Could you give me the nutrition info please? It looks amazing! Hi Debbie, I have not calculated the nutrition info but feel free to use google to find a nutrition calculator I’m sure you could enter the recipe ingredient and get the nutrition info you’re looking for. Converted this to Gluten Free with a one to one gluten free flour and it turned out perfectly! Thanks for sharing the recipe. Could you make it in tiny muffin tins? I’ve only made the recipe as one loaf (as shown) but I imagine it would work perfectly well as a muffin. and moist in the refridge? Feel free to freeze the baked loaf (without the glaze), but I do not recommend refrigerating baked goods, as it tends to dry them out. The loaf will remain fresh a couple days at room temperature, but it never lasts (without being eaten) more than 2 days in my house! I have made this delicious bread several times now and I always refrigerate any leftovers. We take them out and warm them in the microwave and they are still deliciously moist. My 8 year old loves it for breakfast in the morning and it’s easy for me on school days. Thank you for sharing this wonderful recipe! 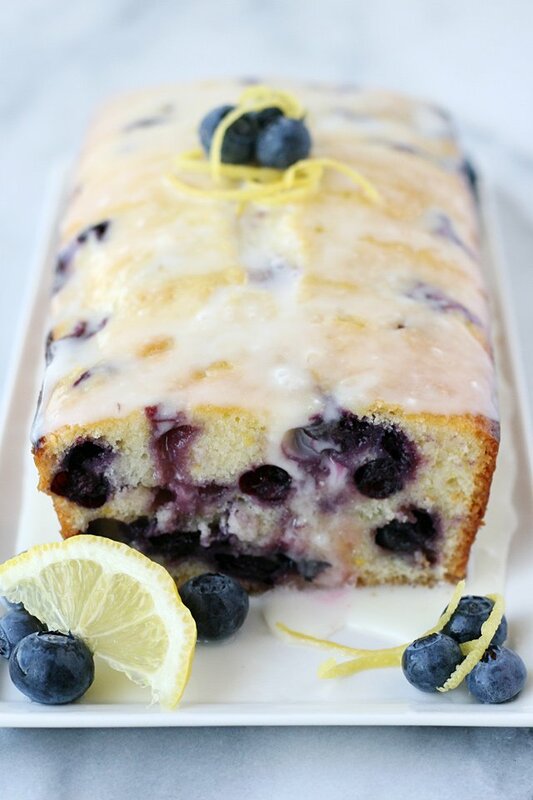 I love blueberries and lemon so this combination is like heaven to me….lol. 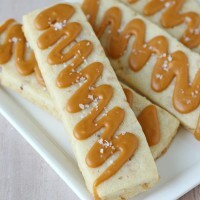 The cover image you used for this post really does this recipe justice, so much so that I couldn’t wait to get baking. Can I just say there was a party of deliciousness happening in the mouth of my friend and I… Bravo!! Oh, and the next day I swear the bread tasted even better. I am going to bake the Lemon Blueberry Bread. I want to put nuts in it. Would it make any difference? What kind of nuts? Walnuts?? If using frozen do I still flour the blueberries? Yes, lightly rinse the berries (fresh or frozen) so they are moist, then toss in flour so the flour coats the berries. 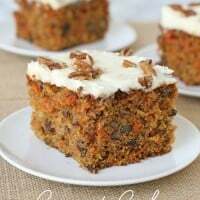 Would orange zest work with this recipe? I’ve only made the recipe as listed, but I imagine fresh orange zest would would be delicious! I made the Lemon Blueberry bread today. I doubled the recipe and made two, putting one in the freezer to have for another time. It turned out perfect and was delicious! I will be holding on to this recipe. Wow! This is amazing!! I used frozen blueberries but coated with flour and they did not sink. I will be making this again! Made this today and it came out delicious!! Blueberries were coated with flour , didn’t sink at all. Beautiful presentation. YUMMY!!!! This looks delicious, I must try it! Could you also turn into cupcakes if you wanted to, or is the texture/density not right for that? I’ve made this and it’s delicious. For anyone who may be having issues, please follow the recipe to the T. I’m a novice and everyone at work thought I’d bought it from a bakery. Thank you Glorious Treats! Can you use coconut flour or almond flour in place of the white flour? Made this last week. It was AMAZING. It’s a pretty big loaf so I gave half to my mom. I was actually wondering if you could maybe half the recipe and make two smaller loaves? Anyone have an idea of how long cooking time would differ? I’m on the welcoming committee in my neighborhood and this will for sure be my go-to recipe for the spring and summer! You can use 2 of the medium tin foil pans and cook them about 10 minutes less, However I always test the center with my cake tester. When it comes out clean they are done. The pans are 3.75 in.w X 8 in. d X 2.38 in. h. Walmart sells them 3 for $.88. I spray them good with Bakers Joy. The bread comes out really well. I wash them and use them over and over. I use these pans with all recipes that makes only 1 large loaf. I made it as a loaf and it was great but not enough. How much modification to to the receipt to make into a bundt? Want to make ke this but my girl does better with no milk. Can I try a milk alternative. Like almond ect.? Any thoughts because I know shed love this. Hello, I am on a lemon craze right now. I made this for my bible study group and the ladies were a rave about it. I used frozen blueberries and I coated them in flour but they still sunk to the bottom. I made it again today and followed the whole recipe but I decided to add my blueberries into the cake batter after I placed a little cake batter in the bottom of the pan. I also made some cupcakes and cooked them according to a cake box recipe and they came out great. How many servings are there in 1 loaf? That just depends on how thick you cut the slices. A standard loaf pan is 9″long, so if you cut 1″ thick slices, you’d get 9. Feel free to cut them thinner if you like. I added some fresh grated zucchini to this, I hope it turns out okay, its baking now…. 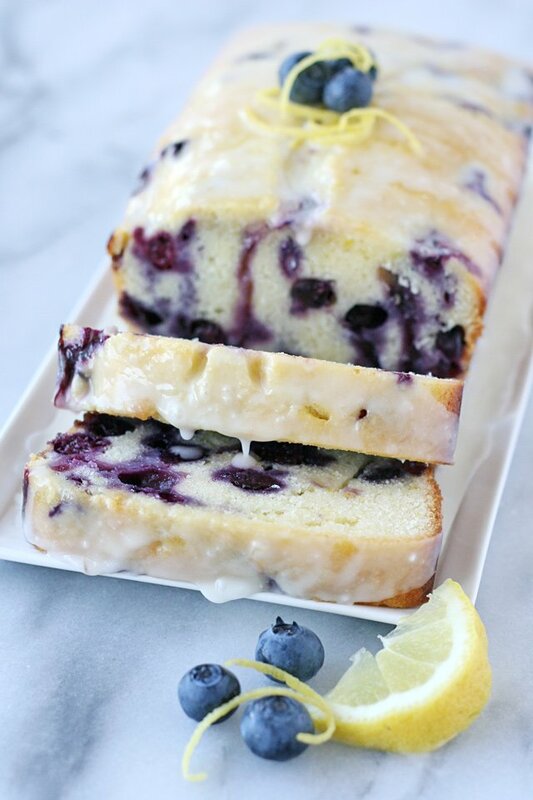 I love anything lemon and blueberry and that lovely photo of this lemon blueberry bread drew me in! Today I made two — one to test taste and share with my family (they loved it!) and one to freeze and share with houseguests this weekend. As suggested, I’ll glaze it just before it’s served. DELICIOUS! I do not have lemons on hand. Can I substitute limes??? Hmm, I’ve never tired it that way and I’m not sure the lime/blueberry combo would be quite the same. Feel free to experiment, but your results will likely be different from what’s shown here. My glaze was not white like yours on the pic. It was just a glaze. Did you do something different on the pic.? Absolutely the best!!! I make it so often, I know the recipe by heart!! It’s a 10 in our house! I just made this AGAIN!! We absolutely LOVE this recipe & yes once again I added garden fresh shredded zucchini to this too & it’s amazing!! What type of loaf pan do you like to use for this type of bread? I have Pyrex glass, light metal, dark metal non stick, and crock type. They all bake differently so what do you suggest for quick breads?